Centaurus constellation is located in the southern hemisphere. It is one of the Greek constellations. Centaurus is one of the largest constellations in the sky. It represents the centaur, the half man, half horse creature in Greek mythology. Sources tend to differ on which centaur the constellation represents, but usually it is taken to be Chiron, who mentored the Greek heroes Hercules, Peleus, Achilles, Theseus and Perseus. Centaurus contains two of the top ten brightest stars in the sky: Alpha Centauri and Beta Centauri. It is also home to Centaurus A, one of the brightest galaxies in the night sky, and to the globular cluster Omega Centauri. The famous Blue Planetary nebula, also known as the Southerner, and the Boomerang Nebula are also located in Centaurus. Centaurus was one of the constellations catalogued by the Greek astronomer Ptolemy in the 2nd century, but it had been mentioned in earlier Greek texts by the astronomer Eudoxus and the poet Aratus. Centaurus is the ninth largest constellation in the sky, occupying an area of 1060 square degrees. It lies in the third quadrant of the southern hemisphere (SQ3) and can be seen at latitudes between +25° and -90°. The neighboring constellations are Antlia, Carina, Circinus, Crux, Hydra, Libra, Lupus, Musca, and Vela. Centaurus belongs to the Hercules family of constellations, along with Aquila, Ara, Corona Australis, Corvus, Crater, Crux, Cygnus, Hercules, Hydra, Lupus, Lyra, Ophiuchus, Sagitta, Scutum, Serpens, Sextans, Triangulum Australe, and Vulpecula. Centaurus contains 11 stars with known planets and does not have any Messier objects. The brightest star in the constellation is Alpha Centauri, which is also the fourth brightest star in the sky. Beta Centauri, the second brightest star in Centaurus, is the tenth brightest star in night sky. There are three meteor showers associated with the constellation: the Alpha Centaurids, the Omicron Centaurids, and the Theta Centaurids. The origins of Centaurus go way back to the constellation that the Babylonians knew as the Bison-man (MUL.GUD.ALIM). They depicted it either as a four-legged bison with the head of a man or a creature with a human head and torso attached to the rear legs of a bison or bull. The Babylonians associated the creature with the Sun god Utu (Shamash). In Greek and Roman times, the constellation Centaurus was associated with a centaur, a mythical creature that was half man, half horse. However, it is not entirely clear which centaur the constellation represents. According to Ovid, the Roman poet who lived at the turn of the first millennium, it represents Chiron, the wise centaur who mentored many well-known Greek heroes: Achilles, Jason, Theseus, Heracles, and Apollo’s son Asclepius (represented by the constellation Ophiuchus), among others. Most other sources, however, associate Chiron with the constellation Sagittarius and Centaurus with one of the less civilized centaurs. Chiron was the son of the Titan king Cronus and the sea nymph Philyra. Cronus seduced the nymph, but two were surprised by Cronus’ wife Rhea. To evade being caught in the act, Cronus turned himself into a horse. As a result, Philyra gave birth to a hybrid son. Chiron was a well-known and respected teacher of medicine, music and hunting. He lived in a cave on Mount Pelion and taught many young princes and future heroes. He died a tragic death in the end, accidentally struck by one of Heracles’ arrows, which the hero had dipped in Hydra’s blood, a poison for which there was no cure. Being the son of the immortal Cronus, Chiron was himself immortal. When the arrow struck him, he suffered terrible pains, but could not die. Zeus eventually released the centaur from immortality and suffering, allowing him to die, and later he placed him among the stars. Centaurus is usually depicted as a centaur sacrificing an animal, represented by the constellation Lupus, to the gods on the altar represented by Ara constellation. The centaur’s front legs are marked by two of the brightest stars in the sky, Alpha and Beta Centauri, also known as Rigil Kentaurus and Hadar. The two stars also serve as pointers to the Southern Cross, which lies under the centaur’s rear legs. Alpha Centauri is a multiple star system, only 4.365 light years distant. It has an apparent magnitude of -0.27. Alpha Centauri A, the brightest component in the system, has a visual magnitude of -0.01 and is the fourth individual brightest star in the night sky, only slightly fainter than Arcturus in the constellation Boötes. The star system Alpha Centauri, however, is brighter than Arcturus. Alpha Centauri A, the primary star, is similar to the Sun: it is a yellow-white main sequence star belonging to the spectral type G2V, about 10% more massive than the Sun. Alpha Centauri B is another exceptionally bright star in the constellation. It is a main sequence star belonging to the spectral type K1V, slightly smaller than the Sun. It has an apparent magnitude of 1.33 and is the 21st individual brightest star in the sky, just slightly brighter than Regulus in Leo. The two stars are believed to be roughly the same age, about 4.85 billion years, and 250 million years older than the Sun. There is a third star in the Alpha Centauri system. It is Proxima Centauri, a red dwarf that forms a visual double with Alpha Centauri AB and is believed to be gravitationally associated with Alpha Centauri AB. Designated Alpha Centauri C, it is separated by 2.2° from the binary star. It belongs to the spectral class M5Ve or M5Vie, which means that it is either a small main sequence star or a sub-dwarf. Its estimated mass is only 12.3% of a solar mass and the star is expected to remain on the main sequence for about four trillion years. Proxima Centauri is only 4.24 light years distant from the Sun and it is the nearest star to our solar system. However, with an apparent magnitude of 11.05, it is not visible to the naked eye. The star is classified as an UV Ceti type flare star, which means that it can have sudden changes in brightness. Its brightness varies between 11.0 and 11.9 magnitudes. Proxima Centauri was discovered by the Scottish-South African astronomer Robert Innes in 1915. Alpha Centauri is the closest star system to the solar system. If there were observers in the Alpha Centauri system, they would be looking at pretty much the same image of the sky that we see, with the exception of the brightest star in Centaurus missing from their view, and the Sun appearing as a 0.5 magnitude star in the Cassiopeia constellation. Beta Centauri is a blue-white giant star, 348.83 light years distant. It has an apparent magnitude of 0.6 and is the tenth brightest star in the sky. It belongs to the spectral class B1III. Beta Centauri is a binary star, with the companion separated from the brighter component by 1.3 arc seconds. The brighter star, Hadar A, is a spectroscopic binary itself. Hadar A is composed of a pair of identical stars with an orbital period of 357 days. At least one of the stars is a Beta Cephei type variable, a star whose brightness varies as a result of the pulsations of its surface. Hadar B orbits the primary pair and takes a minimum of 250 to make the trip. Menkent, Theta Centauri, is an orange K-type giant (spectral class K0IIIb), approximately 60.9 light years distant. The star has an apparent magnitude of 2.06. Its traditional name, Menkent, means “shoulder of the Centaur” in Arabic. The star is also sometimes known as Haratan. Gamma Centauri is a binary star composed of two stars belonging to the spectral type A0, each of apparent magnitude 2.9. The system is 130 light years from Earth and has a combined apparent magnitude of 2.2. The two stars orbit each other every 83 years. Epsilon Centauri is a blue-white giant belonging to the spectral class B1III. It is a Beta Cephei type variable star, one exhibiting variations in brightness as a result of the pulsations of its surface. It has a mean apparent magnitude of 2.29 and its brightness varies from magnitude 2.29 to 2.31. Epsilon Centauri is approximately 380 light years distant. Eta Centauri is a very hot class B dwarf, less than 20 million years old. It is a Be star, one that exhibits variable emissions in its hydrogen spectral lines. It is also classified as a Gamma Cassiopeiae type variable, or a shell star, which is to say that it is a fast rotating star with a disc of gas surrounding it at the equator. The star rotates with an equatorial speed of 310 kilometres per second and its rotation period lasts less than a day. Eta Centauri is 30 light years distant and has an apparent magnitude of 2.33. Alnair belongs to the spectral class B2.5IV. It has an orbital period of slightly over eight days. Delta Centauri is a Be star, a B-type star, belonging to the class B2IVne, classified as a Gamma Cassiopeiae type variable. It is approximately 395 light years distant. The star’s brightness fluctuates between magnitude 2.51 and 2.65. The name Ma Wei comes from the Chinese name for the star, Ma Wei san, which means “the Third Star of Horse’s Tail.” This is a reference to an asterism that Delta Centauri forms with G and Rho Centauri. Nu Centauri is a blue-white subgiant (spectral type B2IV), located about 475 light years from Earth. The star is classified as a Beta Cephei type variable, with luminosity fluctuations attributed to the pulsations of its surface. It is also classified as a rotating ellipsoidal variable star, which is to say a close binary star whose components are ellipsoidal, with variations in brightness occurring as a result of the changes in the amount of light emitting area visible to the observer. Spica, the brightest star in Virgo, is the brightest rotating ellipsoidal star in the sky. Nu Centauri has a mean apparent magnitude of 3.41. Its brightness varies from magnitude 3.38 to 3.41 with a period of 2.62 days. Kappa Centauri is a binary star, approximately 540 light years distant. It belongs to the spectral type B2IV. The brighter component is a blue-white B-type subgiant with an apparent magnitude of 3.13, which has a spectroscopic companion located 0.12 arc seconds away. BPM 37093 is a white dwarf belonging to the spectral class DAV4.4. It is a variable star of the DAV or ZZ Ceti type, which is to say that it is a pulsating white dwarf with a hydrogen-dominated atmosphere and belonging to the spectral type DA. The star exhibits variations in brightness due to non-radial gravity wave pulsations within itself. It is approximately 53 light years distant and has an apparent magnitude of 14.0. Centaurus A is the fifth brightest galaxy in the sky and one of the closest radio galaxies to the solar system. It is either a lenticular or giant elliptical galaxy, between 10 and 16 million light years distant. The galaxy has an apparent magnitude of 6.84. It is believed to contain a supermassive black hole at its centre. Centaurus A is thought to be undergoing collision with a spiral galaxy, which it is in the process of devouring. As a result, there is an intense burst of star formation in Centaurus A. More than 100 star forming regions have been observed in the galaxy’s disk. In 1986, a type Ia supernova, SN 1986G, with a white dwarf star exploding, was spotted in the galaxy. 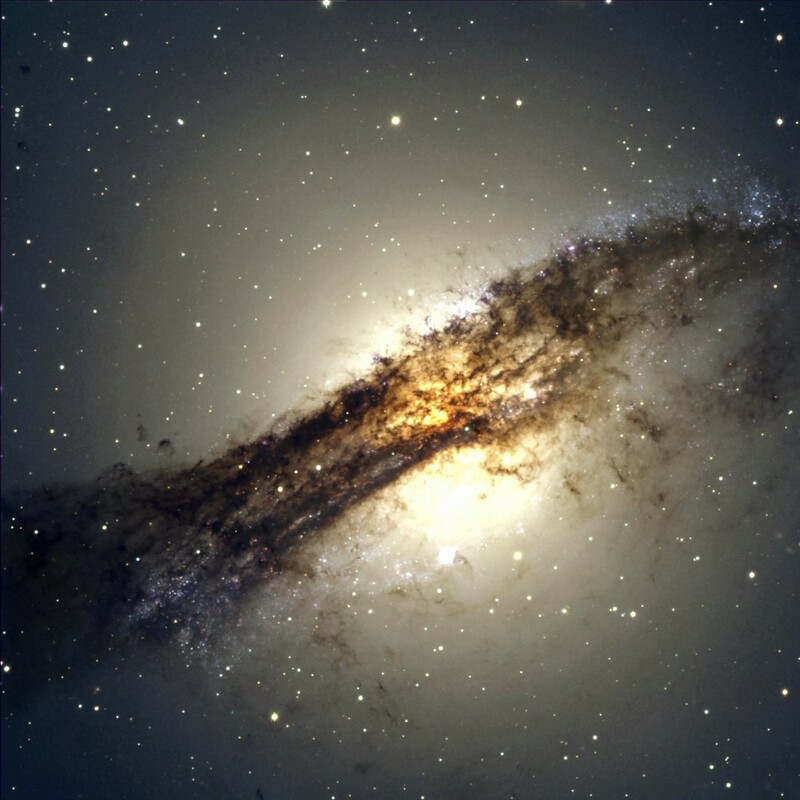 Centaurus A is located at the centre of the Centaurus A subgroup of the Centaurus A/M83 Group of galaxies. Messier 83 (M83), better known as the Southern Pinwheel Galaxy, located in the constellation Hydra, is at the centre of the other subgroup. Omega Centauri is a globular cluster in Centaurus. It is located about 4 degrees south of Centaurus A. The cluster has an apparent magnitude of 3.7 and is approximately 15,800 light years distant. It orbits the Milky Way Galaxy and is one of the largest, brightest globular clusters known that are associated with the Milky Way. The cluster is visible to the naked eye. 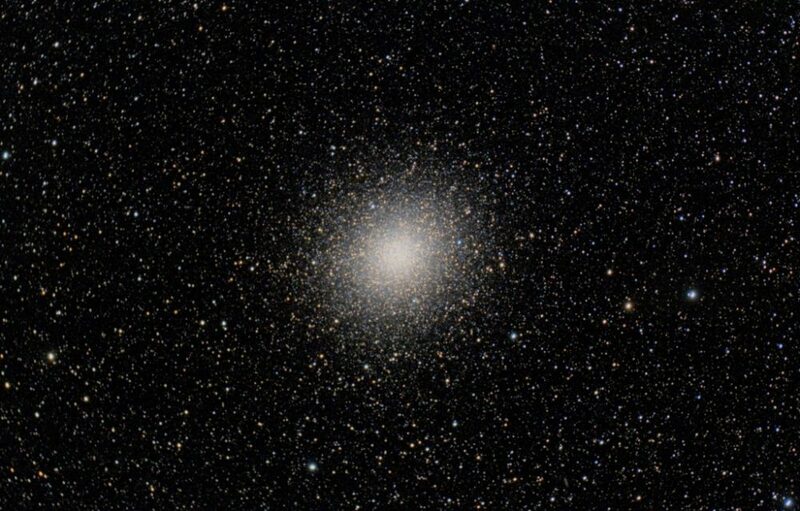 Originally listed as a star by Ptolemy, Omega Centauri was later rediscovered by Edmond Halley who listed it as a nebula in 1677, and eventually by the English astronomer John Frederick William Herschel, who recognized is as a cluster in the 1830s. The cluster contains several million Population II stars and its age is estimated to be around 12 billion years. The stars located in the centre of the cluster lie extremely close to each other, only 0.1 light years away. Kapteyn’s Star, a red dwarf in the constellation Pictor notable for its extremely high proper motion, is believed to originate from Omega Centauri. The cluster is suspected to contain a black hole in its centre. Scientists speculate that the cluster used to form the core of a dwarf galaxy that was torn apart and absorbed into the Milky Way Galaxy. NGC 4945 is one of the brightest galaxies in the Centaurus A/M83 group and the second brightest galaxy in the Centaurus A subgroup. It was discovered by James Dunlop in 1826. The galaxy is approximately 11.7 million light years distant and has an apparent magnitude of 9.3. It is a spiral galaxy that contains an unusual, energetic Seyfert II nucleus, one that might contain a large black hole. NGC 4650A is a polar-ring galaxy in Centaurus, a type of galaxy in which the outer ring of stars and gas rotates over the poles of the galaxy. The polar rings are believed to form as a result of two galaxies gravitationally interacting with each other, or of a smaller galaxy orthogonally colliding with a larger galaxy’s plane of rotation. There are only about 100 polar-ring galaxies known. NGC 4650A has an apparent magnitude of 13.9 and is approximately 130 million light years distant. The Blue Planetary nebula, sometimes also referred to as the Southerner, is a bright planetary nebula in Centaurus. 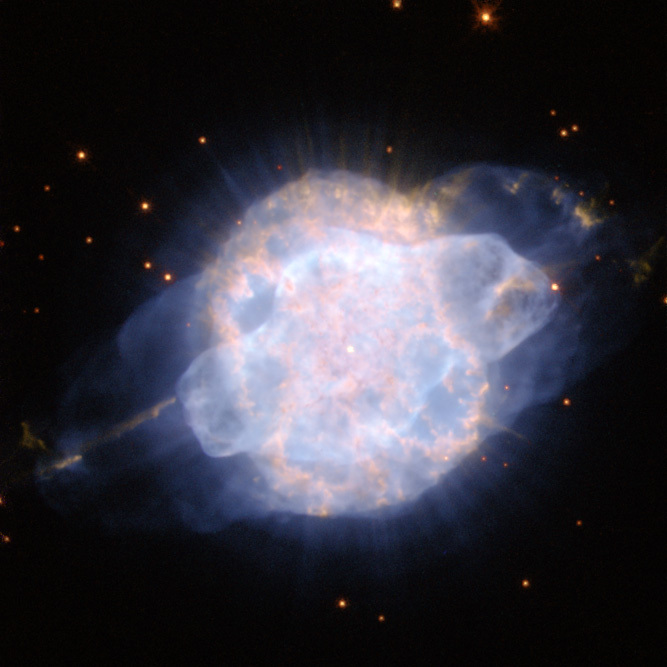 It is the brightest planetary nebula in the far southern region of the sky. The nebula has an apparent magnitude of 8.5 and can be observed in a small telescope. It was discovered by John Herschel in 1834. It is approximately 4,900 light years distant. NGC 4622 is a face-on spiral galaxy, approximately 111 million light years distant. It has an apparent magnitude of 12.6. NGC 4622 has a single inner trailing spiral arm. At first, scientists suspected that the inner arm was also a leading arm, but observation established that it was indeed a trailing arm. The results of these observations were met with skepticism as the notion that a pair of spiral arms could lead was a difficult one to accept. Later, it was discovered that the galaxy had two new weak arms in the inner disk that were turning opposite the outer pair. NGC 5090 and NGC 5091 form a pair of galaxies that are in the process of merging and colliding. They are 150 million light years distant from Earth. NGC 5090 is an elliptical galaxy, one associated with a strong radio source, while NGC 5091 is a spiral galaxy, seen at a steep angle, nearly edge-on. NGC 5091 is currently being tidally disrupted by the collision. The galaxies have an apparent magnitude of 12.6 and 13.9 respectively. NGC 4696 is an elliptical galaxy located about 150 million light years away. It is the brightest of all galaxies in the Centaurus Cluster (A3526), a large cluster containing hundreds of galaxies in the Centaurus constellation. The galaxy has an apparent magnitude of 11.4. It is surrounded by a number of dwarf elliptical galaxies that lie within the same cluster. NGC 5253 is an irregular galaxy with an apparent magnitude of 10.3, approximately 10.9 million light years from Earth. It lies within the M83 subgroup of galaxies. The galaxy was discovered by John Frederick William Herschel in 1787. One of the brightest supernovae of the 20th century, SN1972E, was observed in the galaxy. It had an apparent magnitude of 8.5. NGC 5408 is another irregular galaxy, also discovered by Herschel, in 1834. It lies near the M83 subgroup of galaxies, but it is not clear whether or not it belongs to the group. The galaxy has an apparent magnitude of 12.2 and is approximately 15.7 million light years distant. NGC 4603 is a spiral galaxy notable for containing more than 36 Cepheid variable stars. It is one of the most distant galaxies known to contain Cepheids. The galaxy has an apparent magnitude of 12.3. NGC 5291 is a system of interacting galaxies surrounded by a collisional ring. The ring contains young star forming tidal dwarf galaxies.